R&F Disposal, Inc., is committed to helping businesses meet the requirements of AB341 and AB 1826. Under this California law, a business that generates more than 4 cubic yards of commercial sold waste per week, or a multifamily residential dwelling of five or more units, must arrange for recycling services. R&F Disposal will conduct a waste audit and then help businesses learn to reduce waste and recycle more. We provide roll-offs and bins of varying sizes to meet individual needs. Paper, plastic and metal scrap is collected and processed at a local Material Recovery Facility. Green waste is collected, mulched and reused in landscaping. Mulch helps reduce water use, too. 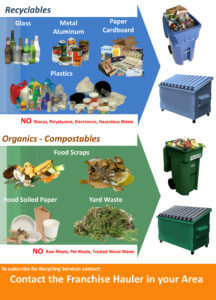 Food waste is collected and sent to a composting facility. The food waste cannot contain oils, fats or protein (such as meat or cheese). Construction and demolition waste, including concrete, wood and metal, is collected and processed for recycling and re-use in a variety of ways. Call R&F Disposal to schedule a presentation about recycling and learn how you can help our communities Go Green. A federal, state, local, regional agency or facility. 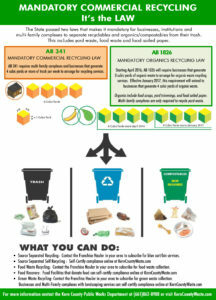 The requirement was signed into law per AB 1826, which is intended to promote recycling and diversion of organic waste from landfills by requiring businesses to accomplish recycling activities and/or participate in recycling programs.